July is here and the year is half over. The past few weeks have felt a little like the week between Christmas and New Year's. That's always an enjoyable period of reflection and goal setting. This year I've been more aware of the passing of time (my hair blows in the wind as the weeks fly by at breakneck speed. At least it would if I had long hair …) and as the end of June approached I found myself reviewing my progress, or the lack thereof. On that note, one new habit I'm happy to say has stuck this year is journalling. At the close of 2011, I decided I was going to give this a real go. And it's worked — I write every day. Most days it's drivel, hardly anything worth looking back on. I note the weather, the time I wrote, and a little of the previous day's activities. It's not the content that I was focused on though, just picking up a new habit. In December, I looked through a few tools and purchased Day One for the Mac. I played with it a little, then promptly never looked at it again and chose pen and paper as my journalling tools of choice. But when reading The Slow Web by Jack Cheng, the notion of using I Done This to track my daily work related doings struck a chord with me. The web app is a nice tool, but I hesitate to add another monthly bill to my budget. Luckily, I have Day One installed on my machine. 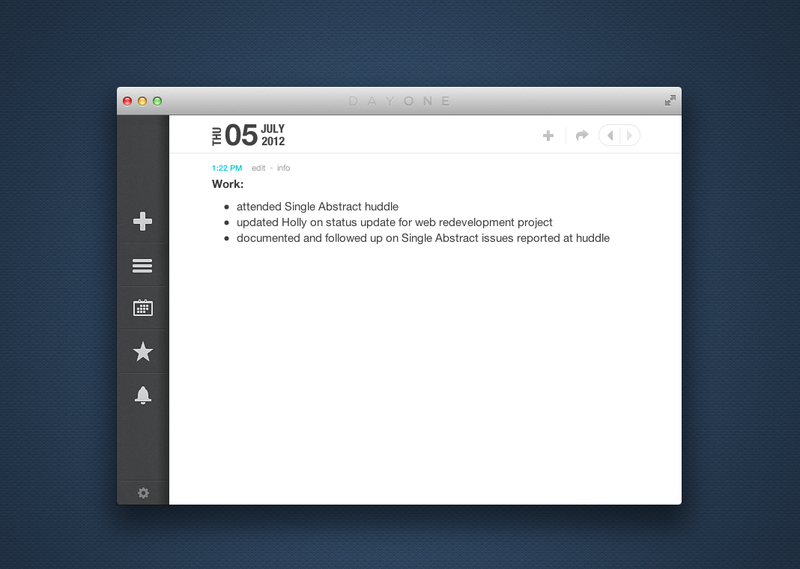 It sports a lovely interface and is able to remind me to jot things down each day. Because I have to track time for my consulting work, this was something I needed to do anyways. Day One is a nice way to go about it. I use the app to track the major activities of my work day. As well, I use it to track the time I spend on any personal project that I want to see progress on. This ensures I get my minimum of 30 minutes per day. All in all, this type of journalling has helped me keep myself accountable.